No matter the frameworks you use and the code you write, the most important is the model that you define to create your system. System Designer helps you to design this model and to generate the classes and components to build your system. What is a system ? With System Designer you create in fact a system and not an application. But what is a system ? reacts to events with actions that we call behaviors. What can I do with System Designer ? System Designer uses UML, a standard, to define your model. So you probably already know how to design in System Designer even if you have never run it. The definition of the model is stored on a JSON format called MSON. With MSON you can define types, classes, one to one / one to many relationships and multi inheritance between classes. Once you have created your model, System Designer generates the skeletons of all your methods. You only have then to add your code to implement them. System Designer provides you helpers to manage your components. You can easily navigate threw components to create your application. There is no need to code to instantiate a component. 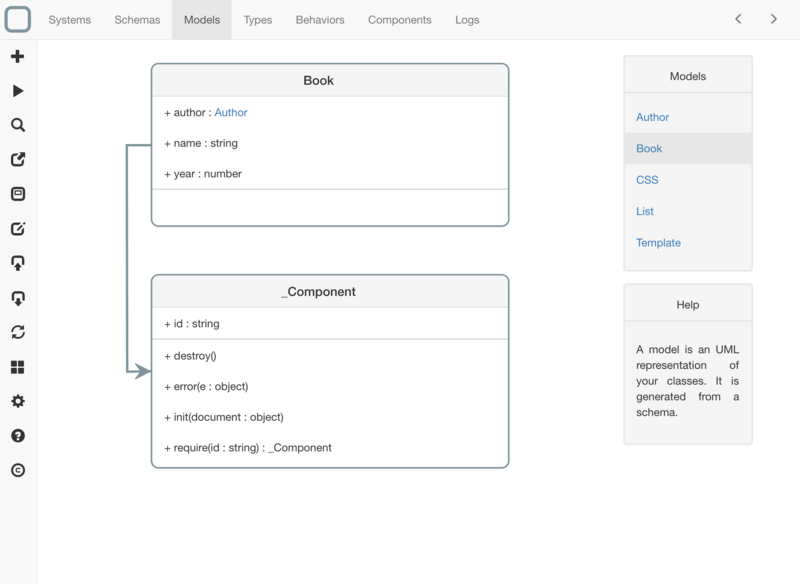 Create a component in System Designer is like creating a document in a NoSQL Database. In fact, System Designer acts as an ODM (Object-Document Mapper) to manage your components as NoSQL Documents. Because you have defined a model for your application, a Dynamic Type Check is done on every action of your system. All warnings are send and shown in System Designer. System Designer can load the model of any system that runs on the browser or on Node.js. You can see the schemas, models, components and methods of the running system and you can edit them. All modifications to the model done inside System Designer will be send to the running system. There is no need to reload to see your modifications. System Designer can be used on Windows 10, macOS, iOS, Android or any browsers. You can also install it in your project: System Designer requires no backend to work, it is a full web application. System Designer has a GitHub module to synchronize your work between all these apps. You can begin your design on your Mac and then continue it on your iPad. Once server started, go to http://localhost:8080/. Copy the content of /dist directory into your System Designer for Electron project. Copy the content of /dist directory into your System Designer for Cordova project. Once server started, go to http://localhost:9001/. All the modifications to the source code of System Designer will rebuild the solution and refresh the page. Do not use System Designer if you do not believe in Equality and Diversity. System Designer is not for people of hate.